Perhaps the best know story from the life of David is the account of him slaying the giant Goliath found in 1 Samuel 17. There are many valuable lessons to be found in this great passage. However, I would like to focus on how David was viewed by the other characters in this passage and make some application to ourselves. To set the scene, the battle lines have been drawn between Israel and their archenemy Philistia (17:3). Rather than have the two armies fight it out and sustain heavy losses, the Philistines propose a match between the two best fighters from each army with the loser’s army becoming the slaves of the winner (17:8b-10). Fighting for the Philistines was the giant Goliath (17:4-8a), while on the Israel’s side was… well, no one. Fear had gripped the men of Israel and they fled and the sight of this man (17:11, 24). Even the reward of riches and the king’s daughter were not enough to encourage any of the Israelites to fight Goliath (17:24-27). However, one day young David, the future king of Israel, happened to be bringing supplies to his brothers (17:17-23). Upon hearing the Philistine taunt the armies of God, David resolved to fight for the honor of the Lord. 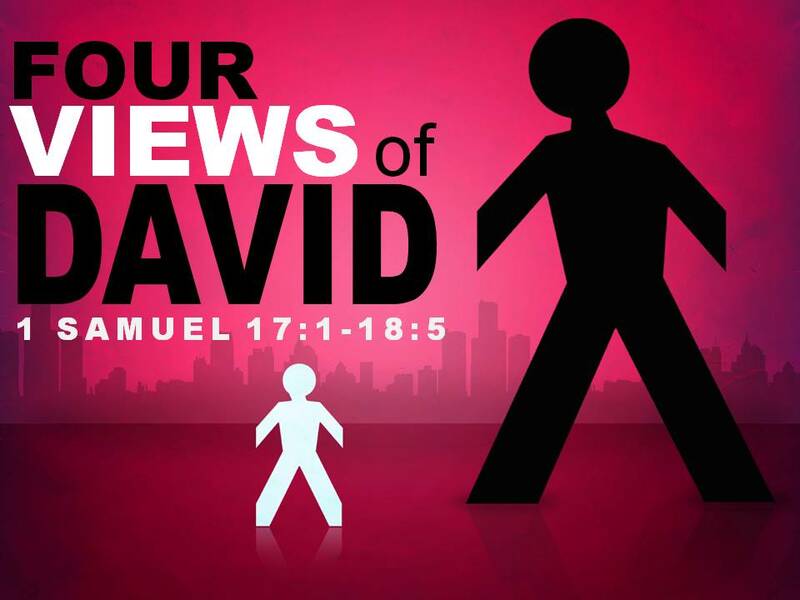 Let’s explore four views of David from 1 Samuel 17:1-18:5 as he fights and prevails over the Philistine. These four views of David and his response to them will form the basis of our application at the end of this lesson. Eliab, David’s brother, was critical of David’s motives for being present at the battle and for talking to the other seasoned soldiers about fighting Goliath. Rather than allowing this unfair criticism distract him, David stayed on course (17:30). Nevertheless, David didn’t allow Saul to stop him from fighting for the Lord (17:34-40). Yet, David didn’t allow Goliath’s view of him cause him to back doubt his God (17:45-47), nor back down from the challenge. So, when Goliath drew near to David, David ran quickly and struck and killed the Philistine “with a sling and a stone” (17:48-54). Following David resounding defeat of Goliath, the people hailed him as a courageous hero and leader. Some people are going to be Critical of your service to the Lord, but don’t let this distract you from doing God’s work. Such was the case when Mary anointed Jesus feet with an expensive ointment (Mark 14:3-9). She was criticized by the apostles for the costly service, but she didn’t let that stop her from serving her Lord, and neither should you. Other people are going to say You Can’t walk with the Lord faithfully. Don’t allow them to stop you from doing what you can do. Remember, “[You] can do all things through Christ you strengths [you]” (Philippians 4:13). Still others are going to hold you in Contempt because you follow the Lord’s teachings, but don’t let them get you down. Find strength in the words of our Lord, “Blessed are you when others revile you and persecute you and utter all kinds of evil against you falsely on My account. Rejoice and be glad, for your reward is great in heaven, for so they persecuted the prophets who were before you” (Matthew 5:11-12). But on the flipside, some people are going to say you’re Courageous in your work for the Lord. But, don’t let their accolades change you, stay humble and remember the words of our Lord, “When you have done all that you are commanded, say, ‘[I am an] unworthy slaves; [I] have only done what was [my] duty” (Luke 17:10). Just like David, people are going to say a lot of things about you; some good, some bad. The key is to rise above their words by remembering who you are: a child of the Most High God. If I can help you in any way with your spiritual walk please email me at clay@claygentry.com. God bless.